This blog was created thanks to a 2011/2014 SSHRC supported research project undertaken by Dr. Jennifer Evans at Carleton University. It explores how historical thinking can inform civic opposition to neo-Nazism and the far right. You can follow her on Twitter @JenniferVEvans. Erica Fagen is a PhD student at UMass Amherst where she is writing a dissertation on vernacular memory, social media, and the Holocaust. Alongside her interest in social media discourse, she is also interested in photography, narrativity and performance, as well as digital history. She is co-writing Holocaust Memory in the Digital Mediascape along with Jennifer Evans and Meghan Lundrigan. Meghan Lundrigan is a fifth year Public History PhD student at Carleton University. Her research examines how every day people alongside Holocaust memorial museums curate the history of violence. Meghan’s research interests also include historical representation through social media, German history, digital humanities, museums, and performance and narrative. She has served as student intern at the Carleton Centre for Public History. She is collaborating on Holocaust Memory in the Digital Mediascape with Jennifer Evans and Erica Fagen. You can follow her on Twitter @megainer. And the students in HIST 3907/PSCI 3809 Populism in History. Check out their bios in the blog. 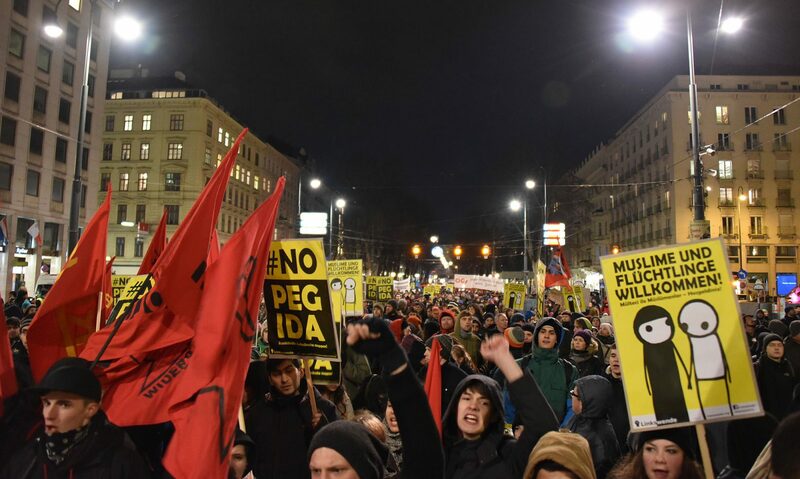 *The title image is entitled: “Offensive gegen Rechts demonstrating against Pegida in Vienna’s Kärntner Strasse” from 2 February 2015, 18:00:49. It was taken by Christian Michelides and is used courtesy of Wikicommons.